Certified laser technician provide gentle and effective F.D.A approved IPL hair treatments at a fraction of the cost and time of other permanent hair removal methods. Be smooth, confident and hair free. Tired of the daily chore of shaving or the monthly expense of waxing? Remove unwanted hair with proven technology. We can offer you a IPL hair removal treatment package for virtually any part of your body. Remove hair from your back, chest, legs, abs, bikini,underarms and arms. 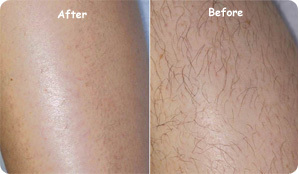 A few IPL hair removal sessions may be needed for ideal results. Treatment sessions are spaced 4 - 6 weeks apart at average of 6 (or more) typically on each area depending on your skin and hair type. after numerous procedure sessions, the melanin is not as effective at regrowing hair, and also a visible reduction in new regrowth is really enjoyed by the individual. Free Consultation with certified laser technician, Zero Cost. 336-774-3094. Certified laser technician, trained by top laser institute in nation. Affordable Rates, Lower overhead cost means we pass savings onto you. Flexible Hours, Extended hours available on Weekend and Evenings. Our last appointment is 8:40PM, early appointments offered at 7AM. Minimal Discomfort IPL treatments, that gives lasting results. Less pain and discomfort compared to other treatment methods. In the long run, IPL hair removal is considerably more cost-effective than electrolysis and other methods like waxing or shaving. Each licensed treatment provider receives more than 40 hours of medically supervised training before being. This is for IPL hair removal as well as our other laser procedures. Contact us 336-774-3094 for free consultation appointment. Our certified laser technician will help answer any questions you may have. Questions and Answers about IPL Permanent Hair reduction. Basically, the IPL is guided by a beam of light that searches for hair follicles (not just one like electrolysis or tweezing) deep beneath the skin disabling or destroying the root. The IPL beam targets only the hair follicles and not the surrounding skin. For comfort, the skin is usually cooled with a gel during the process. The IPL destroys hairs in its active growth phase and up to 85% of our hair is in that phase at any given time. Approximately 100 to 200 hairs can be treated with each flash of the light so that large patches of hair. Though there are many ways to remove unwanted hair (such as shaving and plucking), IPL are the a permanent method of hair reduction. Also, a large area of the skin can be treated via IPL at one time, making the procedure faster and even more cost-effective. Everyone is unique and will react differently to the IPL. The FDA has approved several types of IPL as permanent hair reduction devices. That does not mean 100% hair removal. What is does mean is that a significant percentage of hair that is treated with the IPL will not grow back. Each session should prove to be more successful at removing the remaining hairs than the previous. Will IPL Hair Removal Hurt? IPL hair removal may be somewhat uncomfortable. As with anything, the pain or discomfort you feel may be different from others who have had the procedure. That said, most people tolerate IPL hair removal very well. At first, you will likely feel a slight stinging sensation, indicating that the IPL has been activated. The treatment involves a series of impulses that cause prickling and a slight burning sensation. Most people endure the procedure without any. Some people have likened the feeling to that of a rubber band snapping against your skin. IPL treatments can take from just a few minutes to a few hours, depending on the size of the area being treated. The area being treated determines the time of each session. A smaller area, such as the bikini or the under arm, can take as little as ten to fifteen minutes, as opposed to the back or leg which can take up to an hour. A person should wait four to six weeks between each session. However, you should know that even if you cannot see the hair, it can still be actively growing beneath the skin and the IPL can find and remove the hair follicle successfully. Facial hair should be treated more often than other areas. On average, people need between three and seven sessions to really see results, meaning about 80% hair reduction in the area treated. Will my insurance cover IPL hair removal? No, IPL hair removal is an out-of-pocket expense. With each session you should see significant changes in the amount of hair reduced in the treated area. Because most of the time our hair is in its active growth state, there should always be positive results. The results will vary for people with hormonal imbalance. The FDA has approved IPL hair reduction as a safe means of hair reduction. We will do pre-screening to make sure you are good candidate for IPL treatment. For new clients a free IPL Test Spot check to make sure you skin reaction is normal before doing full area of treatment. Skin should be shaved before treatment. Stay out of direct sun or long periods of time 48hours before treatment. Reduce amount of long period of time you are out in sun 4 weeks prior to treatment. What are the side effects of IPL hair reduction? Most people leave the session with a bit of a temporary rash or “sunburn-like” reaction. Most skin discoloring will go away quickly, leaving no side effects. However, some people have reported permanent skin discoloring and “blotchiness” in the treated area. It is important to listen to the practitioner carefully and apply the post- treatment creams and ointments as directed. The IPL can sometimes either increase or decrease melanin production and make the skin surrounding the treated area darker or lighter. A darker skin condition is known as “hyperpigmentation” and is typically reversible. When the skin is lightened, “hypopigmentation” is the result. Unfortunately, hypopigmentation may be permanent. Using an experienced, highly qualified IPL hair removal technician can greatly reduce the chance of changes in skin tone. Is any anesthetic (Numbing cream) used before treatment or offered? No, To limit the dangers with numbing creams anesthetic. We do not use or provide any anesthetic on top of skin before treatment. Another reason no anesthetic used is because to get proper pain tolerance feedback from you to make settings adjustments on IPL system. What is Post Care of IPL hair reduction? Its important to fallow post care instruction provided to you. Remember to stay out of sun much as possible for 48hours after treatment. Apply SPF 30 sun screen before going out doors for 48hr to 96hrs. Also for 48 hours after IPL treatment do NOT over heat your body by exercise, steams, hot baths or long hot showers or other strenuous activities. Apply Ice if needed. Sometimes, Normally appointment is needed to get IPL treatment. If we have someone cancel we can fit you in same day. We also offer weekend appointments flexibility. Whats the difference with IPL and Laser? There are two big differences between Laser and Intense Pulsed Light systems. One is in the area that can be treated in one go and the treatment speed. Generally IPL treatment heads are up to 8 times larger than the small spot produced by lasers and therefore treatments are much quicker. Send your question, we will answer them by email Click Here to Contact Us or setup a free consultation appointment. *prices subject to change at anytime. *Fullface is not include neck or under chin/neck area. For Larger body size price may increase.